For the first time since FIBA Europe became responsible for youth international basketball the French U20 team have suffered three straight losses in a major championship. France led for most of the game against Russia. But with 93 seconds to play the French team was called for travelling while setting up an attack. The Russians were given the ball and on the 82-second mark Svetlana Efimova was left open at 45° from the basket. She hit the three-pointer and Russia were in the lead for the first time in the match. France did tie the game with 21 seconds to play. However Russia held their nerves in the last seconds to seal the victory (62-59). France must now win their two remaining Qualifying Round group games to stay in the running at the 11th edition of the FIBA Europe U21 Championship. The game started off at an electric space with France winning all he lose balls. Romane Bernies was hustling everything down for France as well as guarding Ekaterina Fedorenkova. France got the first break off an And+1 (2+1) from Sara Chevaugeon (7-4). However the scoring remained difficult because both teams defended well. For France Adja Konteh was a lady on a mission and scored some great baskets for France while Darya Namo was also playing hard for Russia on both sides of the court. Despite the excessive heat in the hall the game was played at fast pace with France just edging the first quarter (17-16). The second quarter was just fast and furious basketball from both teams with no systems just players running up and down trying to score. Both coaches signalled continuously for their players to calm down. 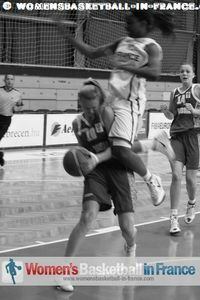 France were able to make another break of the game when Ekaterina Fedorenkova was called for a unsportsmanlike foul while trying to stop Bernies. Bernies hit the resulting free throws (25-18) and less than 30 seconds later she was back with a steal and 2 more points to give France the biggest lead of the game (27-18) with just over four minutes to play before half time. Russia switched to a player on player marking system and basically hit France with fast counter-attacks as they clawed their way back into the game. 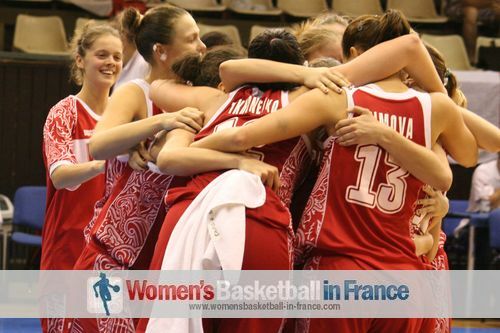 Russia made France pay for two turnovers to make it a 1-point game (28-29) with 45 seconds remaining in the first half. Gregory Halin used his final time-out to set up a play. Yet the Russians switched to zone and his offensive plan failed. Russia almost had the lead on the buzzer but Yulia Poluyanova's baseline jumper lipped out. It was hit and miss basketball for almost six minutes of the third quarter with France holding on to the advantage (36-31) while leading the hustling statistics. Marie Mbuyamba in her hurry to get back in defense practically knocked the head off Namo while sending her crushing to the ground. Namo picked herself up, kind of shook hands with Mbuyamba and then hit the free throws for the unsportsmanslike foul. However France still went 10 points clear after an intense sequence of play. It first had Sara Chevaugeon hitting a big three and then Claire Stievenard was fouled while contesting an offensive rebound. She hit the free throws (45-35). Russia refused to give in and scored the last basket of the quarter (37-45). The final quarter was just plain youth basketball at its best. France had a 9-point lead with around five minutes to play. Then Ksenia Tikohnenko (No. 12 in picture) woke up for Russia. Anastasia Pasynkova (No. 8 in picture) and Namo were all over the place for Russia as they chipped away at the score. However the turning point came when the officals decided to call Agathe Degorces for carrying the ball as she was setting up the decisive play for France. The Russians were given the ball and finished the attack with a three-pointer by Svetlana Efimova to go ahead. Although Christelle Diallo split a pair to tie the game with 21 seconds to play, Russia had 2 team fouls to give and played smart in the remaining time to win this FIBA Europe U20 game (62-59).